SalamAir (Muscat) today (December 7) took delivery of its first Airbus A320neo. The upstart is Oman’s first budget airline. The airline previously announced the addition of six brand new Airbus A320neo aircraft to its growing fleet. The first is now delivered, and five additional leased Airbus A320neo aircraft will in the first quarter of 2019. The new A320neos are specifically customized for SalamAir to seat 180 guests. The airline previously launched operations on January 30, 2017. The airline has grown to operate 173 flights a week operated across 16 destinations in 11 countries. 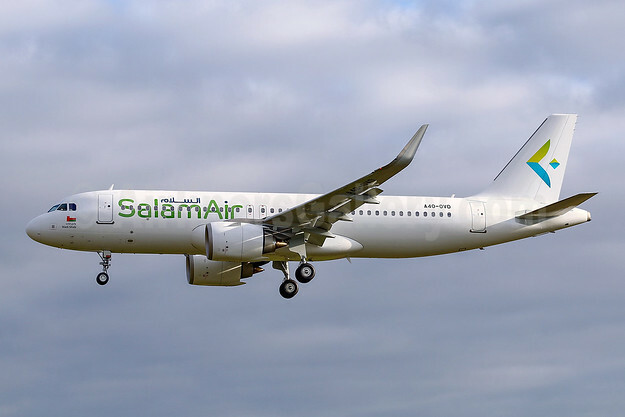 Today, the SalamAir network consists of 16 destinations including Muscat, Salalah, Suhar, Dubai, Doha, Jeddah, Karachi, Multan, Sialkot, Shiraz, Tbilisi, Baku, as well as newly introduced Dhaka, Kathmandu, Khartoum and Najaf. Top Copyright Photo: SalamAir Airbus A320-251N A40-OVD (msn 7181) TLS (Eurospot). Image: 944692. This entry was posted in SalamAir and tagged A40-OVD, Airbus A320-251N, msn 7181, SalamAir on December 7, 2018 by Bruce Drum.